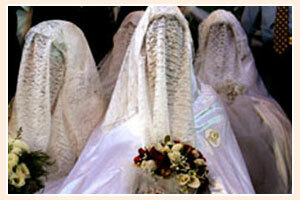 Muslim Wedding is also known by the name of Nikah. This ceremony is celebrated as per the rituals of Islam religion. It is the most different ceremony of all other weddings in India. This ceremony is five day long. Muslim Wedding is conducted unlike the most Hindu weddings at any point of time. There are no beliefs of a specific period of time to conduct marriage. The Nikah ceremony can take place either at the bride or bridegroom's residence. The nikaah ceremony is presided over by the qazi or law officer. The qazi appoints two men as witnesses (Gawah) on the groom's behalf, to receive orders for the nikah from the bride's family.